While former Microsoft CEO Steve Ballmer is busy tending to the hardwood courts of the NBA, his successor at Microsoft, Satya Nadella is hard at work making sure that Microsoft stays competitive with the ever evolving landscape of the internet. With that in mind Microsoft is trying to reposition itself in things that it’s good at like software. Nadella knows that we live in a mobile first and cloud based world. He wants to make sure that Microsoft’s core products, like Microsoft Office, stay relevant in those environments and to do that they may have to work together rather than against competitors. Such is the case with Dropbox a company that, despite having 100 million users, Ballmer dismissed as a “little startup”. Nowadays Dropbox has over 200 million users and is home to over 35 billion Microsoft Office documents, according to an official Microsoft blog post. 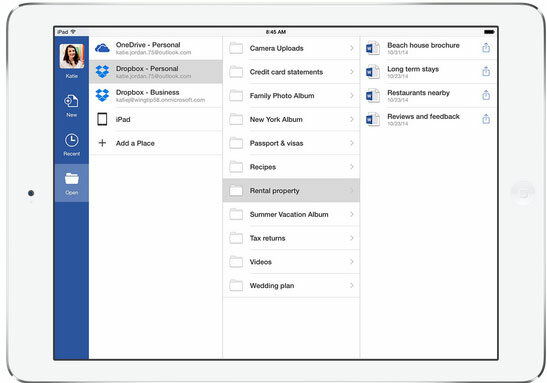 Access Dropbox from Office apps to get to their files and folders faster. Edit Office files directly from Dropbox and sync them across devices. Share new or edited files from the Office apps using simple Dropbox sharing functionality. These changes will take place on the Dropbox mobile apps first with web platforms coming online with these changes in early 2015. This is great news for users of both services that are looking to streamline their work flow.